14 players showed up for yesterday’s Memorial Sunday Open. In the end, it was FM Wolski who took down the $40 first prize and small tournament trophy. Equal 2nd-3rd went to Robert Keough and Peter Korzeb (Top A/B finisher) who both finished with 3 points. Coel Oshiro won the U1400/Unrated section with 2.5 points. Here’s a wild game from the tournament. 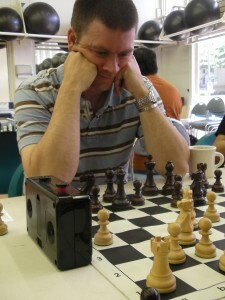 It features equal 2nd place finisher Robert Keough (2001) taking down newcomer Coel Oshiro. This was the only game Coel lost in the tournament and he surely has a bright future in chess.